In retrospect, I was one of the "fickle kids" this documentary talks about. But hey, why make it The Munsters or Batman. I'd gladly watch both. I'd balk at going to swimming lessons given the cliff-hangers around Batman and Robin. My own physical development was taking a back seat to a gripping fantasy. Then our family left Portland, Oregon for Rome, Italy and it was somewhat cold turkey, at least on shows like this. Italian TV didn't even start until early evening, sheesh. I didn't unplug entirely. On the contrary, I developed more of an interest in advertising. We've been putting our heads together, "we" being a clique of Measure 97 supporters, wondering if we might rescue mathematics teachers from their double bind. On the one hand, the high school track is brimming with disappointed students, unable to hack it, but all attempts at reform hit a brick wall. The name of that brick wall is "computer science". The quality of public debate remains low, as people without the terminology or concepts just cannot participate in the conversation. They stay with what they know, such as "will using a calculator make Johnny too dumb to multiply single digit numbers?" I'm not saying that's an out of bounds question. However for someone living in the Silicon Forest, calculators are not the issue. Lets talk about computers, and about the bash shell. Crickets chirping. Having been party to these conversations for some decades by now, with thousands of posts to my name in the infamous Forum 206 @ MathForum, I don't see any sudden clearing ahead at the national level. I do see regional and even more local breakthroughs happening. A lot depends on individual teachers, such as Peter Farrell in California, and A. Jorge Garcia in New York. Both of these math teachers understand that "learning to code" and "learning mathematics" are not antithetical (big word, means "not in opposition to one another"). Most of the action is in Twitter-verse from my point of view. That doesn't mean decisions get made there, only that here's an application that lets us study memes, up close and personal. Watch how "AI" and "data science" mix with "big data" and "machine learning" to give us new blends of science fiction, influential simply in their being widespread. I'm not saying these concepts are empty. On the contrary, substantive shifts are afoot. Drilling down through Twitter gives analysts access to some of the most important memes in a highly distilled (refined) form. We meet on-line, in coffee shops, at brew pubs. I'm not saying we all see eye-to-eye. My talk at Wanderers about matters Raspbian included plenty of Measure 97 talk, 98 as well. Tiz the season. We may not win at the polls, but the opportunities to organize have opened up anyway, and that is for the better. I'll have more time to devote to these issues, as I conclude my two year term as Clerk of the Information Technology Committee for North Pacific Yearly Meeting. 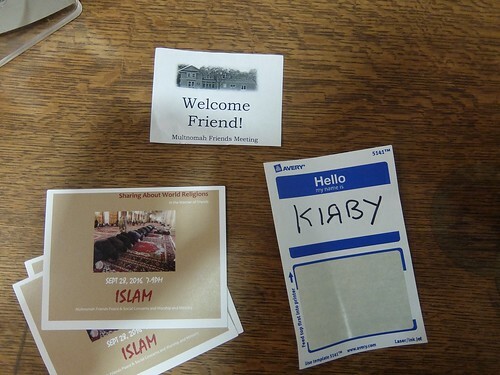 That wasn't a paid gig, given Quakerism is volunteer role playing, for the most part. However I did learn some new project management skills which I'll take with me as we enter this new chapter. That was originally a three year role however the position has a reputation for morphing and I'd rather kick the ball to another team player at this point, now that the job description has changed yet again. "Star Party" is a bit tongue in cheek (a wry joke) as the night sky was overcast and not even the moons (of Jupiter) were to be seen. Never mind, we knew in advance that'd be the case. 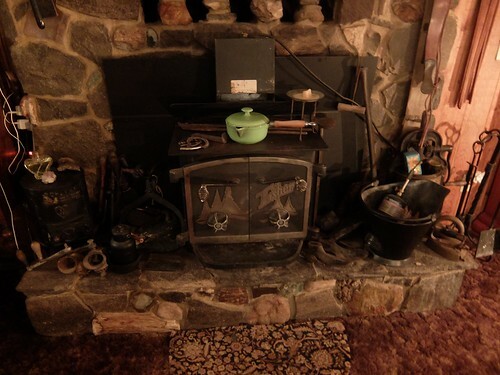 This was our Wanderers retreat, coupled with an open house for Brenda, who runs a farm out towards Mt. Hood. Carol (mom) has been glued to the TV (Internet) watching a conference she didn't make it to in WDC (Washington, DC). Given quite a number of registered ended up in overflow rooms watching on TV as well, her remaining in the comfort of her home office seems a good decision. Since her program started up again early this morning, and for other reasons, we didn't say at the farm very long, were among the very first to leave (when latecomers were just arriving). I tried some really interesting and tasty dishes, including some "LDS beer" (home crafted dark ale by a Mormon craftsman). Given I was the designated driver (with two passengers), I was light on the alcohol, imbibing only three thimble sized cups in the last hour, with my usual couple bottles in the first hour. If we'd stayed any later, I would have switched to coffee. As it was, I was awake and alert both ways, not a problem. We shot out on Hwy 26, returning by I-84 much of the way. The art car works great, still plenty muscular for my needs. Glenn recently found the third of three volumes (with an index), in translation, by that German philosopher guy, bucking to be the next Heidegger maybe? The title of this one is Foam. Glenn says it's about insiders and outsiders, as defined by container metaphors (i.e. spheres, bubbles, systems of any kind -- like a tetrahedron). Given today is Talk Like a Pirate Day, I'm reposting this little Youtube, wherein I suggest where Pyret, the computer language, might fit in to the high school curriculum: along the Lambda Calc track. Speaking of high school, thanks to Nepris for arranging for me to pop up as a talking head for thirty minutes, in an Austin classroom. That's in Texas. Austin and Portland have a lot in common (Keep Austin Weird). Glenn and I returned for the open house today, and met some new people, hatched some new plans. 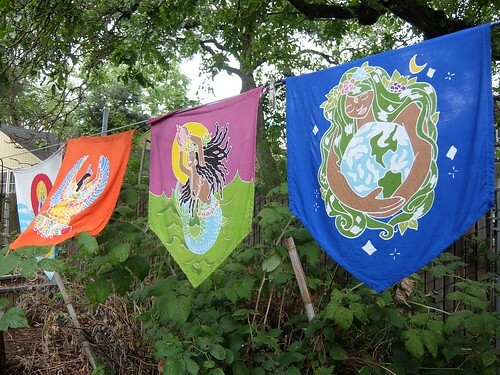 Many pundits do not make the connection between Feeling the Bern, meaning Bernie Sanders, and Burning Man, a Maker Faire writ large on the playa. I've not been to Burning Man and won't advertise any inner circle savvy, save to say I've done some homework. Given Flickr has fixed the embedded slideshow feature, I'll replicate the Hedron slideshow here as well. I watched Sam fix a Kindle today, using his cell to show the video on how to disassemble and reassemble. He was replacing the battery with an after market one. This is a new Sam, heretofore unmentioned. We also talked about World Game / Game World. A lovely community. Carry on. All the embedded slideshows in these blogs stopped working today. I've found enough other Flickr users noticing the change to be sure it's not me. It's the "show" feature itself that's broken, embedded or not. Lets see if Flickr is responsive or knows how to fix its code. Carol had her INR check today, a topic in the election, as Hillary (69) gets her INR checks as well. Presidents typically have their health issues aired as that reminds people to pay attention to their own health. We learned quite a bit about president Reagan's colon. Trump's stats at 70 remind me (58) I need to lose more weight. Carol (87) needs to up her intake of kale a tad. I recently put out another essay on Medium entitled Thinking Globally in 2016. My purpose there was to update a small cabal of readers on some esoteric literature that deserves more peer review going forward, given how we may elect to shift more weight towards some of the technologies therein reviewed. My diet relies a lot on pinto bean burritos I make myself, with raw onion and spinach, grated cheddar, and picante sauce. I also gulp Soylent, a non-dairy "just add water" powdered food designed for geeks with limited time and/or cooking skills. I like to think I do have at least some cooking skills, however the "limited time" label sometimes applies. For exercise, I continue walking up Mt. Tabor many mornings. Thanks to the bicycle, I'm also well positioned to circle around in Laurelhurst Park a few times, a pleasant up and down affair, something like the kiddy-coaster at Oak's Park. The beer is what makes me a bit of a fatso, though I've lost some since Lithuania. Those following on Twitter know I'm eager to check out Hedron, a maker space, among other places, in follow-up to Maker Faire, part of PDX Maker Week. Lindsey Walker (40+) whipped through on a tight schedule, heading from Kathmandu to OSU. Joel was her greeter this time. My chauffeur duties have sometimes included meeting her plane or seeing her off. Not this time. Melody also stopped by briefly to say hello. I picked up on the Susan Lindauer thread today and forwarded one of her early book tour videos to WILPF for evaluation. Per her book, she was detained under the Patriot Act. I've been reviewing a bunch of dot-connecting Youtubes many of my readers will likely already know about. We get different inbox materials at different times in partially overlapping scenarios (to use some Buckyspeak). CIA director Brennan was on CBS News tonight suggesting new leaks might be forthcoming soon. Have people had time to digest what's already been leaked? When did they find the time? Lets hope the Flickr slide share API comes back to life. That's been a really cool feature. My parents suffered their car crash, fatal to my dad, in October, 2000. I'd been to Lesotho to help with the aftermath, Julie taking over. On September 11, 2001, I was in Portland. Dawn came to me in tears with the unfolding news on TV. I'm respectful of all the work the science community has done, some members of which I've met (Chandler... Margulis), regarding their independent investigation of what went on that day, so tragic and still mysterious. I'm not one of those jumping up and down saying I know the answers. "A convergence of special interests?" That doesn't tell us anything. However, I do think the Truthers may underestimate their readers and viewers. They suggest we need psychological help because we're still in denial about what they reveal. I'd say we're not in denial, by and large, just what's the next move? The Truthers are calling for a new, independent investigation, taking us to a next square beyond the NIST report. So who's really in denial? On a board game called, Lets Do the Rational Next Thing, that might indeed be the next square. I haven't noticed we're playing such a board game though. Our shared reality defies mere rationality. If powers that be so effectively control the storytelling, then what would move them to suddenly unroll the red carpet for those not into playing along with their preferred narratives? Just asking. Please don't suppose I'm booing from the peanut gallery or throwing rotten tomatoes. On the contrary, I see a lot of good science. I'm just wondering why the scientists think "the rules of science" need be followed, in the sense I raise above. As Margulis suggests, PR rules, at least in the short term. Lets hope the scientists and engineers will continue with their independent investigation, the one they've been doing. It's not like the "official" power structures have been eager to pay for it, I realize. Many would prefer to focus on other matters and find the myths more comforting, are quite content to live in fantasy-fiction, a kind of Matrix. What's the benefit of waking up? I admit that type of denial does exist. Put another way, the fog of war is called that for a reason. I've only known a world at war, starting with the Kennedy assassinations when I was in second grade living on Capital Hwy near Multnomah Village. I've been in fog ever since. It never lifts, right? We live and breath it. In the course of living in fog, I've lived outside the US, moved back, taught in schools, programmed computers, raised a family. We're like so many ships passing in the night, right? Lets avoid crashing into each other at least? I do think the general public puts a lot of trust in science and generally respects the work of those seeking more truth. That's an uphill battle, I agree. Some brands of political discourse have gone down the figurative toilet, turned more potty-mouth, more like urine, thanks to their not being willing to communicate much science. That changes their alchemical composition. Lots of people have noticed the change in tone. 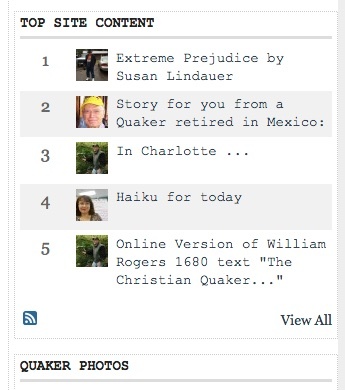 On another topic, I've recently learned that the QuakerQuaker website, where I've committed some writings, much of it discussion-oriented, might be going away soon. I'll be copying some of the content to other web sites. I enjoyed a great turnout for this Raspbian presentation, an induction into the subculture of Raspberry Pi for some of us. My focus was the ARM chip itself, billions served, and I kicked it off recounting my first stumbling upon the Acorn system, in Paro, Bhutan (Druk-yul). Some Brits had set up shop there, and were not running DOS or Windows. The ARM chip was inspired by UC Berkeley + Stanford writings on a RISC architecture, which remained pie-in-the-sky insofar as Intel x86 was concerned, the Pentium and so on offering rich vocabulary chips. The ARM, in contrast, stayed more comprehensible in some scenarios, and lower power, so made its way, post Acorn, into Samsung and other devices, running applications (A), as well as more real time (R) and embedded (M) devices. The ARM network of partners rivals (and partially overlaps) Intel's. So from Advanced RISC Machine to these three "architecture profiles", ARM has preserved mnemonic value, good branding. 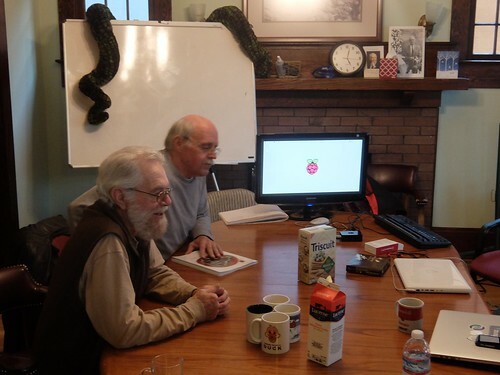 Raspberry Pi is its own brand and Barbara Stross, bless her good sense, brought raspberries and yogurt, the better to celebrate with. The Pi is likewise a "Py machine", playing well with Python. I brought the museum-worthy Python Software Foundation's retired mascot to the event. Mascots are not so much in fashion these days and this stuffed toy had no role in the latest Pycon, here in Portland. Maybe I'll lug her (Naga), to the next one, and bequeath her back to some booth. I ended up with her thanks to Steve Holden, former PSF chairman, and quick to ride the wave of mascots being cool, when they were. 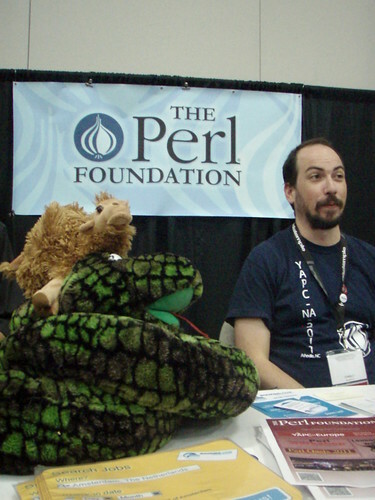 Below, you'll see said Python snake cuddling with the Perl camel. This went along with my quip that the Dutch windmill in the Republic of Perl background was "Guido's house", so close was Python to Perl, even if with some different philosophies (ours more zen). Some Silicon Forest heavy hitters came out of the woodwork for this one and educated me on various matters, including Measure 98, as distinct from Measure 97. They make sense as a duo. I passed Peter Farrell's Hacking Math Class around, as suggestive of what Math + Pi, vs. Math + TI, might look like. I also screened my Habitat for Humanity talk during the break, in part just to show off how the Pi 3 can stream Youtubes, no problemo. After the meetup we checked out the new campus mural, gradually materializing to our immediate west. The Far West becomes the Far East in that puzzle Christopher Columbus never quite figured out. He was more interested in gold than worldly wisdom, is what the pundits say. I digress. Yes, to some extent I made Texas Instruments the bogey-man in my story, but not the good engineers who'd invented the microchip. Of course the scientific calculator is a miracle to behold. I understand how we might get somewhat cultish about it (I was, about the HPs). TI is also in on the ARM action I'm finding, so it's not like we have to play either / or here. Oregon's high schoolers might get more bash shell soon (the Linux dashboard / API) as technology permeates STEM and/or STEAM (A for Anthropology, part of PATH). I'm not against showcasing Intel's Edison within #CodeCastle (a space of keepers). Stay tuned. My special "in" or "angle" on this production is I'm friends with one of the co-producers, the Taylor Twins dad, Allen Taylor, another Wanderer. 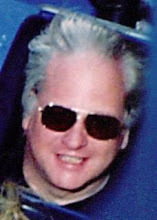 Thanks to Allen's mind-bending family, my horizons were earlier expanded by Evil Cult, my induction into the Stryker series. That I saw this new 2016 movie almost back to back with the 1976 Logan's Run was perfect, as the Stryker films synthesize and parody a million hours in between. I'd call it "gentle parody" because it jumps right in with its own twisted storytelling, with no aloofness. Film has many sweet spots in lower budget realms, as in Serenity. TV has been both a curse and a blessing, in providing new techniques. I'm not the expert. This film had a large crew and some surprisingly good production values. Some stuff "looks fake" in the way Budapest Hotel looks fake -- quite on purpose. Mostly what's on display is mastery of the medium. Nic Costa and company have film making down. The small Laurelhurst theater #3 was packed, as it had been in theater #1 after Logan's Run. I'd stayed behind hoping to squeeze in but ended up buying a ticket for Sunday instead. I walked both ways from my Richmond abode, through the same Laurelhurst park I'd been riding around just hours before. Tyrants of Time is dedicated to film buffs, with so many implicit and overt allusions to its genres (horror, science fiction... ) that enumeration would be pointless. Back to the Future might be a place to start. Yes, the goblins look like Gollum. Yes, that's the Star Trek guy (Walter Koenig) choosing to stay there. Allen plays a cameo as usual and I was watching for him. 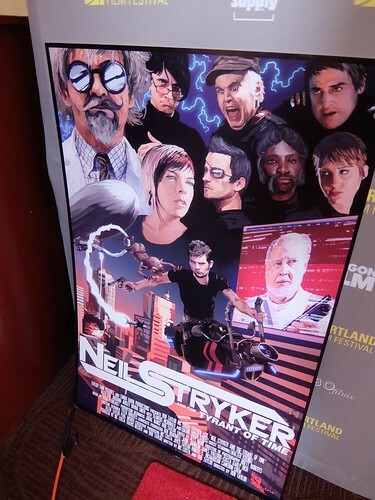 Note that Rob Taylor plays Neil Stryker and the Mad Scientist. That's part of the fun. Newcomers to these blogs need those DVD series catch up segments, like in Lost, as if it mattered in Lost. These blogs have long-running themes, and one of them is "what is work?" with "work / study" a connected meme. In a physics sense, breathing and oxygenation of the blood is a huge workflow involving miles of tubing, and pipelines off photosynthesis whereby sunlight, atmospheric components, and dirt (with living minerals) are transformed into fruits and vegetables, and not only in Central America. A human being outputs somewhere between 200-300 watts in some models. Watts are already a per time unit, and brightness is a measurable aspect of burning energy more quickly, a higher wattage. In economics we say "productivity" but then we also say "pace yourself". We're getting into athletics. An athlete "works out" and "trains" to perform in specific ways, in a kind of theater or play that's more kinematic than about spoken lines, though off the field we do interview players, as a part of the sportscasting genre. Spoken line theater requires acoustics. We have that inside the helmets sometimes, but not for broadcast in that case, as we don't want the opposing teams to lurk in on each other. Human metabolism is only practical within a "phase space" of related parameters. Your exact place in that phase space is fixed by "arguments" corresponding to those parameters, the latter (the params) being the algebraic "placeholders" like x, y in some linear or many-powered equation. When you figure out the (x, y) pairs that solve the equation, you get a line or other manifold of points and may refer to individual points by their (x, y) address, by their args. How much you care about "continuity" depends on the namespace. Permeability may be assumed in cell biology. For example, if you eat a huge amount and only exercise a little, your body has a clever way of banking the excess and saving it for a rainy day, when you'll have a way to "burn it off" maybe by shivering. You've gravitated to a specific space in the phase space, a set of neighboring points wherein a human metabolism remains a continuing possibility. However if that rainy day doesn't come soon, your slowing down may spiral and you'll wind up in bed having a hard time overcoming your own inertia. A kind of Gibbs Phase Rule is involved. How much pressure are you under? What's the temperature? When you can't get out of bed, your muscles start to weaken. Astronauts know about working out in zero gravity, but for humans on Earth, countering gravity is their chief workout, even when swimming. People get driven to work in order to pay off incurred debt in many cases. Every bill to pay becomes a debt, so lets summarize everything in nature, in chemistry, as a kind of bookkeeping in which energy laws must be followed, and not because humans say so, but because physicists don't find exceptions, or if they do they get new kinds of phenomena, like "dark energy" to compute with. My schedule drives me to walk a few miles most mornings. If you 3D print the Asylum District from say Sunnyside-Richmond out to the Mt. Tabor neighborhood, you'll notice a continual rise in altitude going east, in the direction of the Mississippi, parallel to the Columbia Gorge, perpendicular to the Pacific coastline. I'll do work (in the physics sense) climbing to the top of Mt. Tabor and then descending. I've made this trip over and over. Without diving in to any "black budget" or "dark web" for my example data, I'm able to come around full circle and identify Labor with some kind of bookkeeping, relating to biophysical "expense accounts" such as flowers and bees incur, simply as a consequence of needing to stay powered. They've got that wattage to work through, at a specific rate. DWA / 4D Solutions got started in bookkeeping, as a fund accounting and computer programming partnership. "All You Can Eat" restaurants sound like a losing proposition until you factor in the obvious: a single human has a finite capacity, even if "pigging out" (as we learn from our farm days to name certain eating habits). Biology kicks in. You're not given take-home boxes, as you are where you buy by the portion. The food is yours to eat now, not later, and that puts an upper lid on it. In General Systems Theory, our Sims games (remember Sims?) may revolve around a refugee camp. Able minded able bodies show up, with a mix of disabilities, everyone perfectly who they are, and self organize. On TV they may say the children in refugee camps are getting no education but that's impossible as humans self program more intelligently than any Deep Learning neural net the AI people have managed to come up with. AI people tinker in their garages, looking for magic algorithms, but humans are born with working equipment. Confusing learning with school is a confusion on the part of the TV people, not the work / study students in the camps. In GST one looks to the cafeteria line in an All You Can Eat setup wherein most refugees aren't into pigging out. But they haven't room to cook or stash much food in their living quarters in some models. They have a study carrel there, a PWS, with a Rasberry Pi... did you notice the science fiction elements here? That's called "modeling" or "as if" (like on a Google Sheet). We swap in different models of Cubby (importing from the CSN namespace). In an earlier chapter, we were all about the XO, another educational device. What I'll be doing on Monday is sharing about an API, what Harry Potter or his school mates wave their magic URL over to make the stone release its sword. That's right, I'll be telling tall tales, sharing lore, around a somewhat technical subject, dry as bones if not jazzed up a bit. I'll be presenting about that tiny Flask application I've been working on, the one with the Glossary, Periodic Table (unfinished) and Shapes tables behind a veil. Farmers expecting to haul vegetables to the cafeteria from photosynthesis sites (solar powered), need the calories to do the hauling, plus the lifestyle, if done for long hauls, requires pacing. The farmers may use a variety of comm devices and Linux-powered calendars to inform their HDTVs. One windmill + storage battery may suffice for the electronics, with a backup generator. The farmers intermix with the refugees, in terms of roles. We may or may not need to model language differences. In Martian Math, we may tell a science fiction story in which the ETs have safe refuge, on one side of the gorge, Earthlings on the other. Or call it a compound, or campus. The farms are nearby. Assume the ETs and Earthlings overlap in the same metabolic phase space and are able to file through the same cafateria line and "pig out" together. That's to serve plot line development. We're building a fictive phase space in which to engage in STEAM learning, with A for Anthropology, a part of PATH (see The Math Myth by Hacker). In building a dam together, the Martians and Earthlings need to compare and reconcile different models of 3rd powering, the whole XYZ vs. IVM thing. My morning walk up Mt. Tabor is a habit of longstanding, however given the new bike from a sponsor, I'm trending towards other loops that exercise different muscles and elicit other kinds of real time judgement. Portlanders (PDXers) love to bicycle so I'm no sore thumb in blending in with the other cyclists, even with all this grey hair (or "white" as some call it). I often bill Portland as one of those Chinese Gate cities, where you may preview the so-called Far East, which is further West from our side, or maybe North along the coast and over to Nippon. 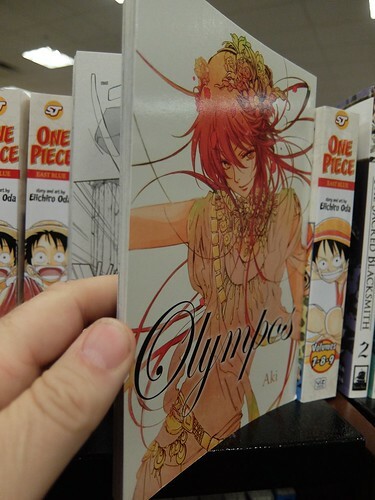 You'll find lots of Japanese influence in stateside culture here, including in the Manga section at Barnes & Noble. You'll notice the book binding puts the cover on "the back", with pages turning from left to right. Fewer magazines adopt that format, though still purport their authenticity as true Manga specimens. At OSCONs and such you'll find Manga characters pressed into service for didactic purposes, teaching calculus, or maybe chemistry. Japanese speakers may first learn about Synergetics + Linux on a Raspberry Pi, thanks to some fantasy characters talking about "spells" (Linux commands) and Wizardry (shades of Harry Potter). The Japanese edition of Scientific American had that article by Yasushi Kajikawa, present at SNEC's creation. We've had a lot of time to build on these modular studies since then. Maybe in some back street in Okinawa you'll come across such an underground comic. The fact that Antiprism + Povray were first pipelined in an Oregon VML (a subtype of PWS) won't matter. That's just the ambient Pacific Rim economy hard at work. Next up: Anime.